What's better than a vacation in Paradise? A vacation with a group of your favorite people. BOOK 5 ROOMS OR MORE AND SAVE! For Travel January 2 – June 30, 2019. For Travel July 1 - December 20 2019. January 2 - December 20, 2020 & 2021. AND A COMPLIMENTARY UPGRADE** TO A BUTLER LEVEL SUITE! LET US HELP YOU PLAN YOUR BEST GROUP VACATION EVER! Come experience the very pinnacle of luxury Caribbean all-inclusive vacations at Sandals Resorts. Sandals luxury resorts, set along the most gorgeous tropical settings and exquisite beaches in Saint Lucia, Jamaica, Antigua, The Bahamas, Grenada and Barbados, feature unlimited gourmet dining, unique bars serving premium spirits and wines, and every land and water sport, including complimentary green fees at our golf resorts and PADI® certified scuba diving at most resorts. If you are planning a wedding, Sandals is the leader in Caribbean destination weddings and honeymoon packages. Your perfect family and friends getaways await you at Beaches All-inclusive Resorts in Jamaica and Turks and Caicos. Play on pristine, white–sand beaches caressed by crystal-clear seas. Spend your family vacation in luxurious rooms and suites. Enjoy a whole array of incredibly exciting and fun activities for kids of every age. Truly, Beaches Luxury Included® vacations in Jamaica and Turks & Caicos promise unforgettable family fun beneath the Caribbean sun. Do You Have a Scuba Diving Group? Includes PADI® Certified Scuba Diving with the Best in Equipment, Staff and Unbelievable Dive Sites. * A minimum of 5 divers required. DON'T WAIT! START PLANNING YOUR NEXT GROUP VACATION TODAY! SANDALS Terms and Conditions Include: Booking window until further notice. Up To 7% Off Offer: Offer is subject to space availability, is capacity controlled and can be revised or withdrawn at any time without prior notice. Not responsible for errors or omissions. 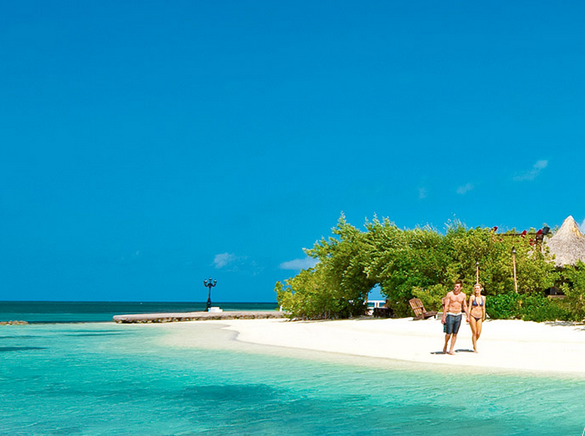 Promotion valid at all Sandals Resorts except Sandals Inn. Riviera Bamboo Grove Premium category or higher for Sandals Ochi Beach Resort. Not applicable to Over The Water Bungalows or Villas. Offer is not combinable with any promotion which offers a rate reduction on specific room categories (i.e. the 7/7/7 promotion). Applicable to any type of contracted groups from 5 rooms or more. Not applicable to Single Occupancy or Children rates. Valid on new contracted groups starting July 16, 2018. To be eligible for this promotion guests must fulfill the following conditions: 5 rooms or more booked via contract only outside of 45 days prior to arrival. **Black–out dates and restrictions applies to all Free Room promotions. Free Room Offer: Free room offer for the 6th room or 12th room free varies by travel date. A minimum of 3 paid nights required. *Offer Excludes Sandals Inn in Montego Bay, Jamaica. Offer is valid in all room categories at participating resorts except – Sandals Ochi Beach Resort is based on rooms booked in Riviera Bamboo Grove Premium category or higher. Valid on Group Code or Group Contract and Maximum 5 rooms complimentary per group. The value of the complimentary room credit is based on the lowest rate and the shortest length of stay booked and based on double occupancy. Complimentary room credit is not calculated on a cumulative basis. Complimentary rooms may only be utilized during the program dates. Staff rooms do not count towards the complimentary room(s). Free Room offer is subject to availability, is capacity controlled and varies by resort and travel date and may be changed or withdrawn at any time without prior written notice. One (1) Butler suite category upgrade is based on 12 paid rooms with the entry level butler category being available at the time of booking (not applicable to Weddings or ReTie The Knot Groups). Both Free Room and Butler upgrade offers are subject to availability, capacity controlled and varies by resort and travel date and may be changed or withdrawn at any time without prior written notice. BEACHES TERMS AND CONDITIONS INCLUDE: Booking window until further notice. Up To 7% Off Offer: Offer is subject to space availability, is capacity controlled and can be revised or withdrawn at any time without prior notice. Not responsible for errors or omissions. Promotion valid at all Beaches Resorts. Offer is not combinable with any promotion which offers a rate reduction on specific room categories (i.e. the 7/7/7 promotion). Applicable to any type of contracted groups from 5 rooms or more. Not applicable to Single Occupancy or Children rates. Valid on new contracted groups starting July 16, 2018. To be eligible for this promotion guests must fulfill the following conditions: 5 rooms or more booked via contract only outside of 45 days prior to arrival. Free Room Offer: Free room offer for the 6th room or 12th room free varies by travel date. A minimum of 3 paid nights required. Offer is valid in all room categories at participating resorts except - Sandals Ochi Beach Resort is based on rooms booked in Riviera Bamboo Grove Premium category or higher. Valid on Group Code or Group Contract and Maximum 5 rooms complimentary per group. The value of the complimentary room credit is based on the lowest rate and the shortest length of stay booked and based on double occupancy. Complimentary room credit is not calculated on a cumulative basis. Complimentary rooms may only be utilized during the program dates. Staff rooms do not count towards the complimentary room(s). Free Room offer is subject to availability, is capacity controlled and varies by resort and travel date and may be changed or withdrawn at any time without prior written notice. One (1) Butler suite category upgrade is based on 12 paid rooms with the entry level butler category being available at the time of booking. Both Free Room and Butler upgrade offers are subject to availability, capacity controlled and varies by resort and travel date and may be changed or withdrawn at any time without prior written notice. †New Dive Groups offer † Unlimited diving available for certified divers. ‡ Beaches Social Group inclusions plus Special Fall Groups promotion. This package is available at all Sandals Resorts & Beaches Resorts except Sandals Carlyle. Private boats are based upon availability. Additional boats are available at a special discounted price of $750.00 per boat. 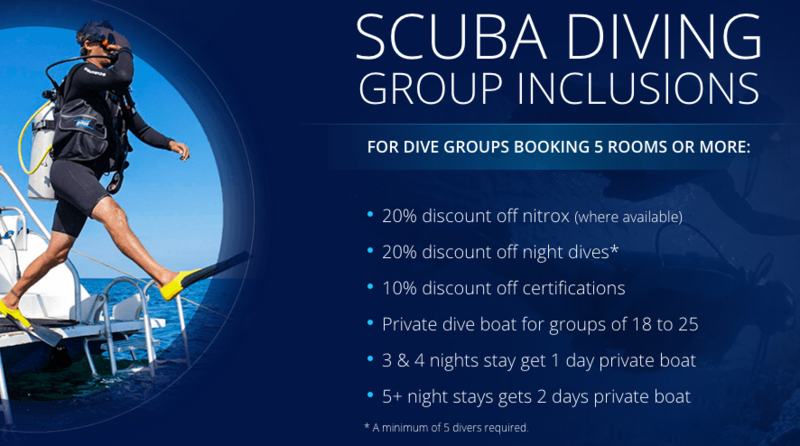 Groups with less than 18 people will join other guests on scheduled dives. A $15.00 processing fee will apply to the free Specialty Dive Course. Dive inclusions are based on space availability and weather permitting. No diving within 24 hours of flight departure. Not combinable with any other dive offers. May not be combinable with any other group packages and promotions. Blackout dates and restrictions may apply.